As target bird sizes continue to increase so does the difficulty in keeping the birds cool during hot weather. 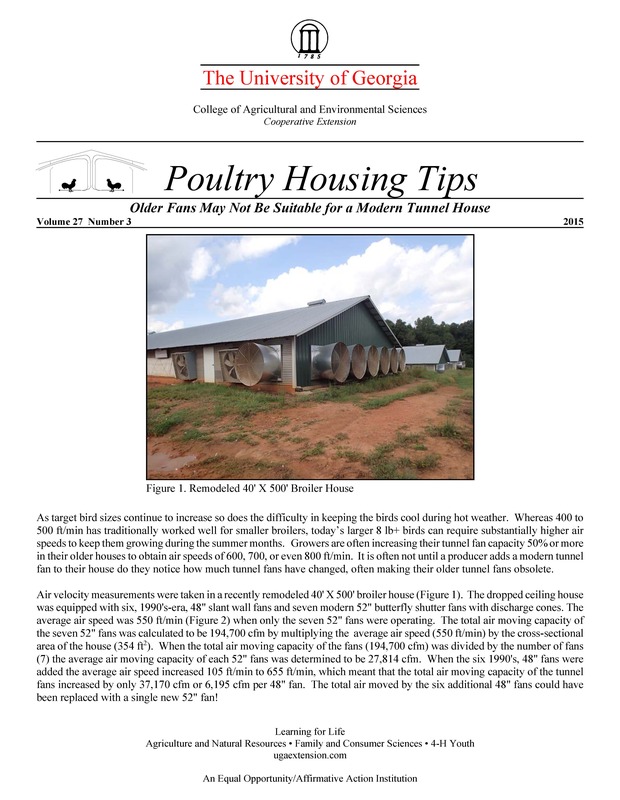 Whereas 400 to 500 ft/min has traditionally worked well for smaller broilers, today’s larger 8 lb+ birds can require substantially higher air speeds to keep them growing during the summer months. Growers are often increasing their tunnel fan capacity 50% or more in their older houses to obtain air speeds of 600, 700, or even 800 ft/min. It is often not until a producer adds a modern tunnel fan to their house do they notice how much tunnel fans have changed, often making their older tunnel fans obsolete. Air velocity measurements were taken in a recently remodeled 40' X 500' broiler house. The dropped ceiling house was equipped with six, 1990's-era, 48" slant wall fans and seven modern 52" butterfly shutter fans with discharge cones. The average air speed was 550 ft/min (Figure 2) when only the seven 52" fans were operating. The total air moving capacity of the seven 52" fans was calculated to be 194,700 cfm by multiplying the average air speed (550 ft/min) by the cross-sectional area of the house (354 ft2). When the total air moving capacity of the fans (194,700 cfm) was divided by the number of fans (7) the average air moving capacity of each 52" fans was determined to be 27,814 cfm. When the six 1990's, 48" fans were added the average air speed increased 105 ft/min to 655 ft/min, which meant that the total air moving capacity of the tunnel fans increased by only 37,170 cfm or 6,195 cfm per 48" fan. The total air moved by the six additional 48" fans could have been replaced with a single new 52" fan! Total house power usage was also measured during the air velocity testing. When all the fans were operating the total house power usage was 19.5 KW. When the six 48" fans were turned off power usage decreased to approximately14 KW, indicating that the six 48" fans were consuming approximately 5.5 KW of power or 0.92 KW per fan. Three of the 52" fans were turned off and the total house power usage decreased to 14.8 KW indicating they were each consuming approximately 1.76 KW of power. It is important to keep in mind that though the power usage of one of the 52" fans was a little over twice the power usage of one of the 48" fans, it was moving over four times the amount of air, making the 52" fans twice as energy efficient as the 48" fans! Another way to look at this - the six 48" fans only increased the air speed by approximately 16%, but total fan power usage increased by 31%! This particular farm provided a good example of the fact that when upgrading older tunnel-ventilated houses to higher tunnel air speeds it may prove advantageous to replace a houses’s older fans with modern ones. This is not to say that there are some older fans that cannot be used, but the performance of many older fans can suffer significantly under the higher static pressures commonly seen in houses where air speeds over 600 ft/min are being targeted. As air speed in a tunnel house increases so does the pressure the fans are working against. In the 90's the typical target air speed was relatively low (400 ft/min) and therefore the work/pressure the tunnel fans were under was relatively low (< 0.10"). Today, when many poultry operations are growing birds to over 8 lbs. the target air speeds have often been increased to over 700 ft/min which has resulted in static pressures often exceeding 0.15". Unlike many modern tunnel fans, many of the fans manufactured in the 90's were simply not designed to move air under such high static pressures. Comprehensive air velocity measurements taken on a number of farms has shown that the air moving capacity of a properly maintained 1990's 48" is typically between 10,000 and 15,000 cfm (@ 0.15"). When the belts and pulleys are worn and/or the shutter is dirty this can easily drop to below 10,000 cfm. As a result many of our older tunnel fans are not moving much more air than a modern 36" fan. One of the best ways to determine if an older tunnel fan is a good fit for house where high air speeds are targeted is to look at its air flow ratio. A fan’s air flow ratio is determined by dividing its air moving capacity at a very high static pressure (0.20") by its air moving capacity at a low a static pressure (0.05"). A tunnel fan’s air flow ratio along with other important performance information, can be found at the BESS Fan Laboratory website (www.bess.illinois.edu). Modern tunnel fans typically have an air flow ratio around 0.80, indicating that as pressure increases from 0.05" to 0.20" the air moving capacity of the fan will only decrease 20%. Though there are some older tunnel fans with similar air flow ratios, the problem is that there are some, as in the case above, that have air flow ratios below 0.70. This means that the air moving capacity of the fans will decrease 30% or more when working under high static pressures, making them poorly suited for use in high air velocity/high static pressure tunnel houses. A good indicator that your older tunnel fans may have a low air flow ratio is the tendency for their shutters to close when used in conjunction with modern tunnel fans. On the farm previously discussed, when six 48" fans were operating the static pressure was low (< 0.10") and the fan shutters were fully opened. When the seven 52" fans were also turned on the static pressure increased (>0.15") and the air moving capacity of the 48" fans was reduced to the point where the fan shutters were barely opening. It is not that the new fans were “robbing air” from the 48" fans, but rather due to the fact that the 48" fans were simply not able to move much air under the high static pressure generated when the seven 52" fans were turned on. When looking to add fans to your tunnel-ventilated house make sure you take a long hard look at your existing fans. Though they may have been “state of the art” when they were installed, the fact is that like our birds, tunnel fans have changed substantially over the last 20 years. Purchasing all new fans for a house can represent a substantial investment, but in some cases it may prove to be a very good way to maximize both bird performance and your farm’s energy efficiency in the long run.